Standing on the site of the first U.S. lighthouse built in Alaska, the present Five Finger Light Station was completed in 1935, only two years after the original lighthouse completely burned to the ground. Funding was made possible by monies allocated by Public Works under the Roosevelt administration during the “Great Depression”. The Art Deco design of the new lighthouse is typical of a 1930’s lighthouse architectural style apparently unique to Alaska. The original 1902 boathouse and carpenter’s shed survived the fire and are reminiscent of classical lighthouse out buildings. They are wooden structures painted white with red shingled roofs. The discovery of gold in Southeast Alaska in the 1890’s, and the subsequent surge of ships carrying prospectors, minerals, and tourists to and from the territory, accentuated the need for an increase in the number of aids to navigation along the Inside Passage. The fishing industry also increased traffic along the inland waterways. With the establishment of large canneries, cannery workers and the fish products they produced plied the waters of Alaska. 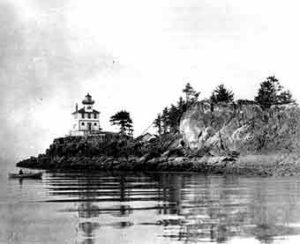 Mining companies and merchants concerned for the safety of their workers, wares and customers, along with territorial officials seeking to insure the safety and development of Alaska’s waterways, pushed for the development of lighthouses in American waters. One of the areas receiving the most attention was Stephens Passage leading to the quickly developing mining town of Juneau. In 1901, $22,500 was commissioned for the establishment of a lighthouse on the southern most island in the Five Finger group. The light was lit on March 1, 1902, one of the two lighthouses to begin service that date. This station operated for 21 years before the lighthouse building burned to the ground in 1933 and was replaced with a temporary light. The new lighthouse, built 10 feet away from the original lighthouse, was completed in 1935. There are still two original 1902 buildings remaining at this light station. The current Five Finger Lighthouse built in the Art Deco style, is known for its accentuation of verticality and use of geometric forms. The style was used on all Alaskan lighthouses established in the 1930’s and its use in lighthouse architecture was prominent only on the coast of Alaska. The reinforced concrete design employed in the construction of Five Finger was chosen for its ability to withstand the harsh climate of the Alaskan coast. The site became significant in 1902, when the first Five Finger Lighthouse was established. The fact that a light station has been maintained on this site since 1902, combined with the fact it was rebuilt during the Depression and further was the last station to be unmanned in Alaska indicates the historical and contemporary importance of this site. The lighthouse currently provides visible historic representation of construction significant to 1902 and 1935. Five Finger Lighthouse is currently owned by the Juneau Lighthouse Association, a non-profit organization established to preserve and maintain this historical site. The lighthouse is an active aid to navigation and is automated by the use of solar panels. It is also a weather reporting station for the National Oceanic and Atmospheric Administration (NOAA). 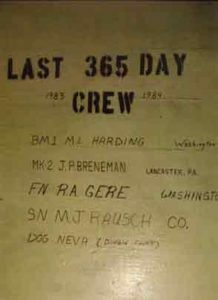 This historic navigational aid is now enjoying another chapter in Alaskan maritime history. The Juneau Lighthouse Association’s intent is to preserve, maintain and make accessible this site to the public. As a renewed presence in this area, JLA plans to promote economic development in this region that has been affected by changes in the fishing and timber industries. When the site is restored, our goals include; a marine research site and a public educational facility focusing on the marine and maritime significance of this area. Visitors to the island will experience the workings of a lighthouse on a remote site while enjoying the unparalleled beauty of this area.